Changing your hair can be liberating, but as anyone who's had black hair knows, it can also be challenging. Getting black out of the hair is hard for even the most skilled professional, but going from black to red is the easiest to do. It is not a short process, but it's possible. Purchase a red color of your choice. If buying a box color, use the developer included. If you're buying from a beauty supply, buy the color and 40 volume developer. Apply color to midshaft and ends first, then apply to the roots last. Be sure to saturate the hair well and evenly. Allow color to process for 45 minutes to an hour. Reds need to process longer because of the intensity of the color, and in this case because of how dark the color is to begin with. Buy hair bleach and red hair color along with 10 and 20 volume developer at your local beauty supply. Mix the bleach and developer in a color bowl to a creamy texture that isn't too thin. Always wear gloves when dealing with hair color, especially when using bleach, because the chemicals can burn your skin. Apply bleach starting with the ends and working your way up. The ends usually take the longest to lift because they have been colored over the most. Make sure to cover all artificial color, but do not apply bleach to any natural color or out growth. Watch the color for desired lightness. When the hair is at a red-orange color it's ready to be shampooed. Try not to over lighten the hair because if you do it will be harder to get the hair to hold the color afterwards. Towel dry your hair and mix the red hair color and the 10 volume developer together using equal parts. Also, mix the color and 20 volume together if you have natural roots. Start at the roots using the appropriate mix, 20 volume for any natural color and 10 volume for any pre-lightened hair. Apply to your entire head of hair making sure to saturate it well. 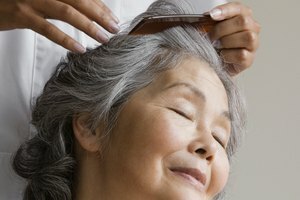 Allow to process for 45 minutes to an hour, then shampoo. It may be necessary to repeat the color process twice if the hair doesn't take it. Sometimes when going from black it can be wise to see a professional, because it's hard to know what the hair will do. When lightening with bleach, check your hair periodically for damage by lightly pulling on a strand. If breaking occurs, shampoo immediately. Always wear gloves when using hair color, especially red hair color, because it stains everything.